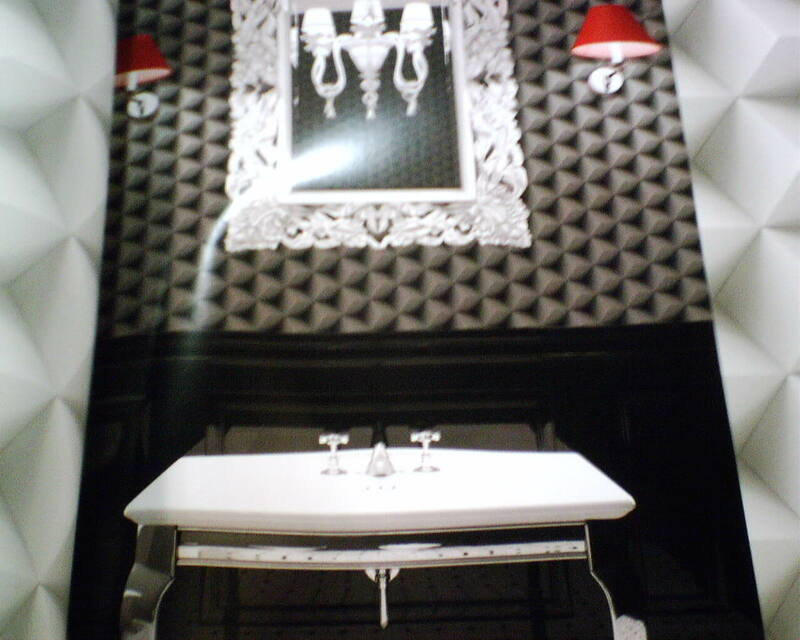 There are various types of non-woven substrates. I like the thinner ones OK. This particular one is thick and spongy. 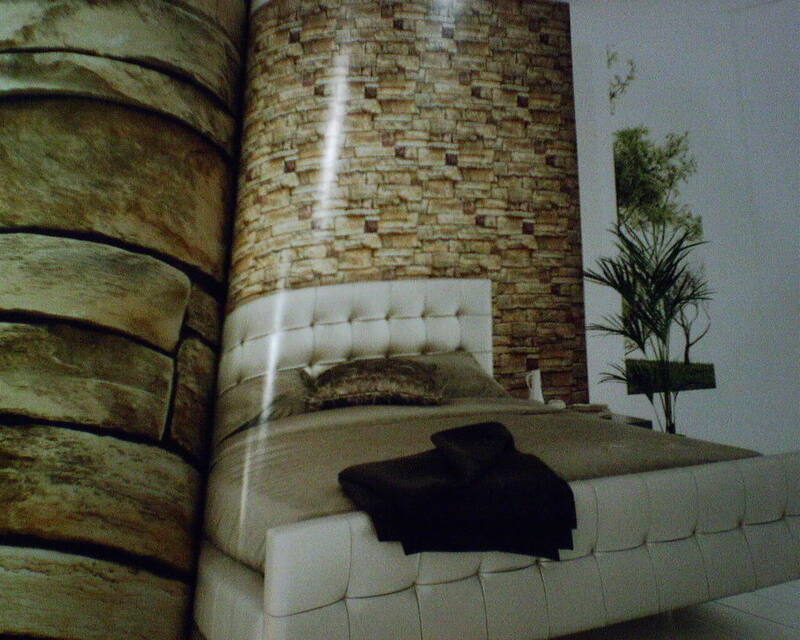 It’s hard to push into detailed areas or corners, making trimming difficult and imprecise. And the littlest movement or force can cause it to crease or become mashed. The crease in the photo happened when I simply picked up a strip of paper and the top half flopped forward. 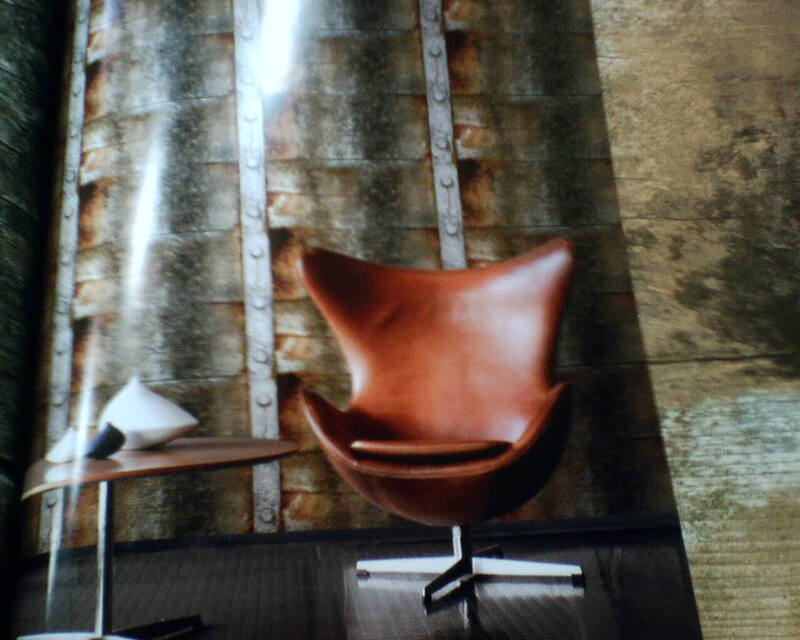 It’s likely that this crease will not be noticeable once the paper is up on the wall and dry. But, still, it might show. Many of the thick, stiff non-wovens have visible seams. 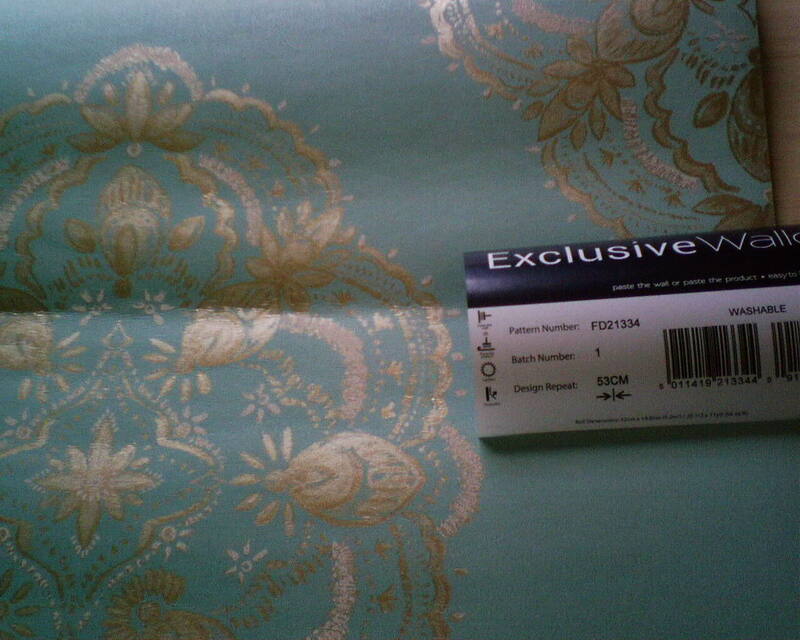 This one was thick, but it was soft, and I was really pleased with the seams – positively invisible. 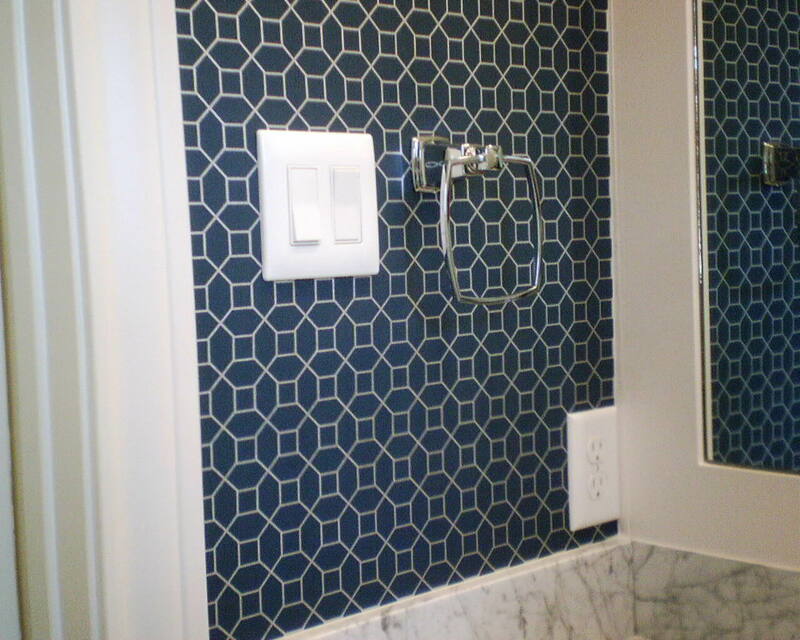 Here I am hanging a small geometric pattern in a bathroom in a home in River Oaks (Houston). The home was built in 1940, and there has been a lot of movement since. Read: The walls, the ceiling, the door and window frames – none of these are plumb or level. 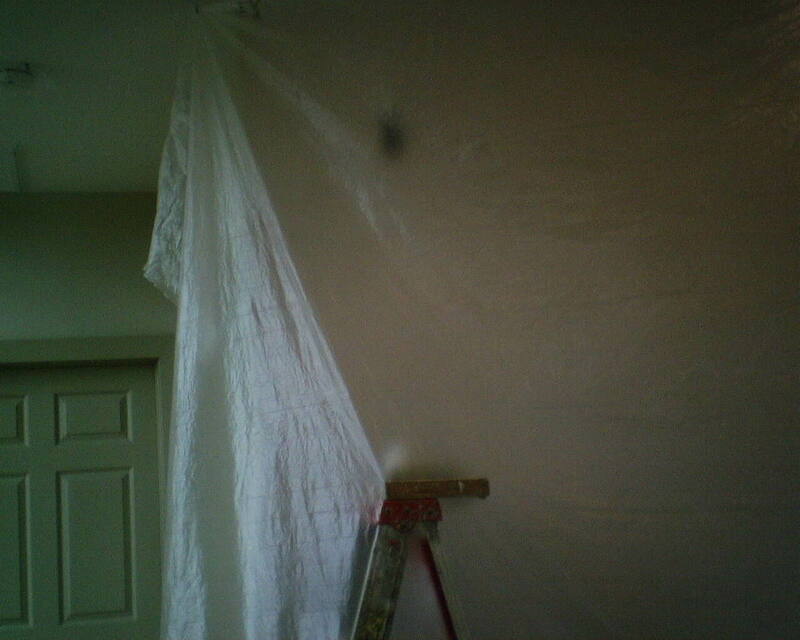 And I mean, some of the areas were out of plumb by as much as 1 1/2″ from ceiling to floor. 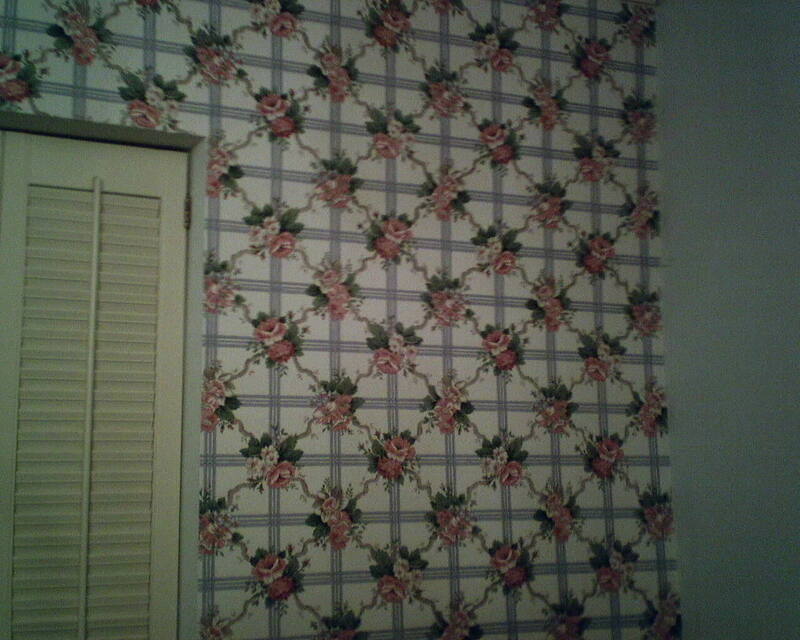 Read: With a floral paper, you might not notice if things don’t line up perfectly. 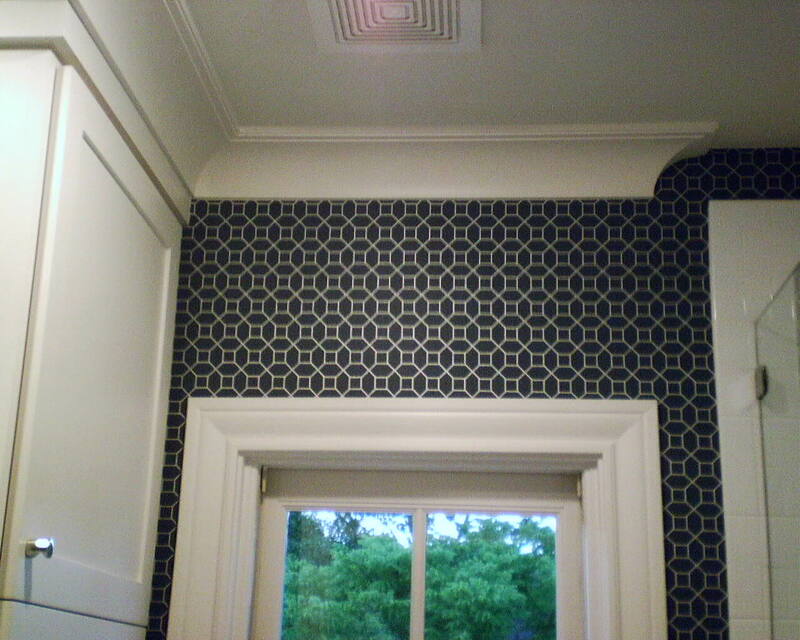 But with a geometric pattern, you will definitely see it if the horizontal elements in the wallpaper are not parallel to the horizontal lines in the ceiling and moldings. What to do? I’m less concerned about hanging true-to-plumb, and am more concerned with keeping the motifs evenly lined up at prominent areas, such as the ceiling and at door and window moldings. In the top photo, I have just hung the short strips over the shower (to the right in the photo), and am working my way to the left. The crown molding is level; the paper I just put up is not. If I hung my next strip to comply with the un-plumb pieces I just placed over the shower, they would be off-kilter with the crown molding. Meaning, you would have 3/4″ of navy blue at the top of the wall on the right, tapering to 1/4″ of navy blue when you get to the left end. So, I faked it. 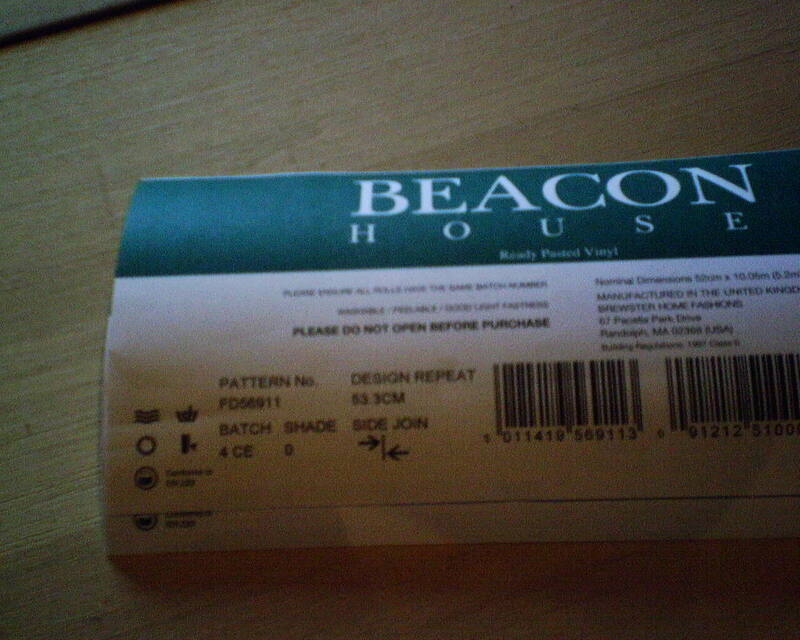 I was lucky, because this pattern was the same right side up as it was upside down, and also sideways. This gave me the option of “railroading” the paper – running it horizontally, instead of vertically. 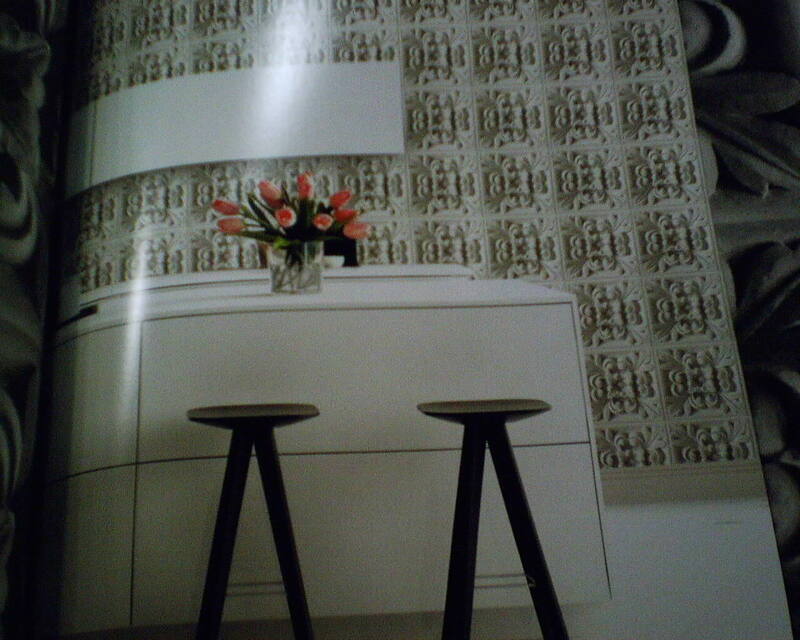 The layout of the room also afforded me many opportunities to tweak the paper and the pattern. 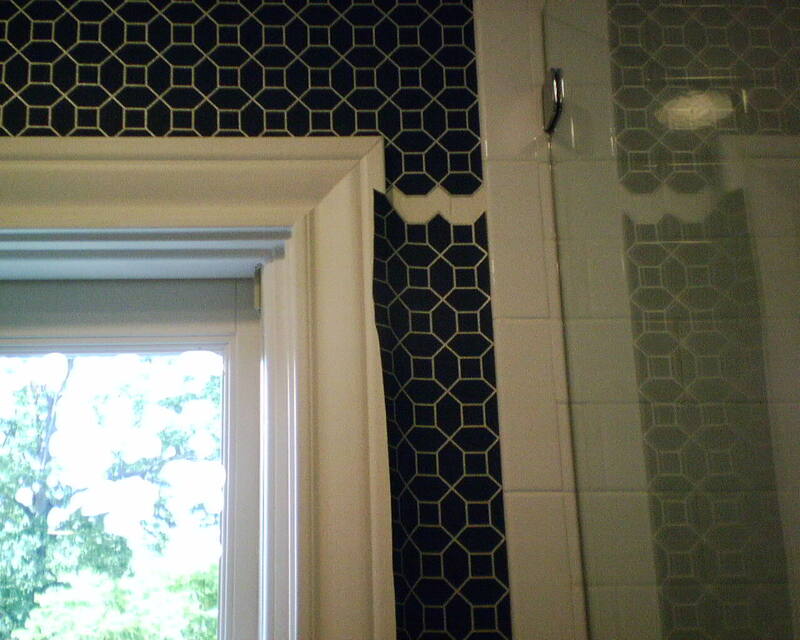 Where the wallpaper ends to the left of the shower tile, and to the right of the curved crown molding, instead of bringing a full-length (8′) drop down to the floor, I stopped the paper near the top of the shower tile, cutting along the honeycomb pattern. My next piece was run horizontally, from the shower tile left past the window, and ended at a cabinet on the left. To disguise the unconventional seam, I cut along the honeycomb design of my new strip of paper, and overlapped it onto the existing paper (and used special adhesive designed to stick to the vinyl paper). It might be off a tiny bit at the point of overlap, but it’s such a narrow strip that you will never notice. 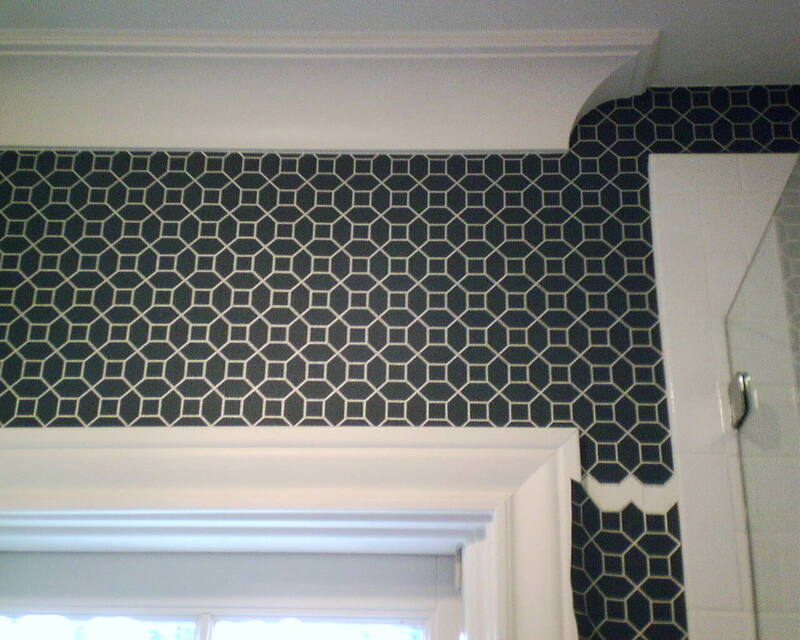 What’s important is that the pattern is nice and straight as it runs along the crown molding. It is a little off along the top of the window molding – but that is because the crown molding and the window molding are not parallel. In fact, they form a trapezoid. You can’t fight a trapezoid! (As you may have learned in high school geometry. 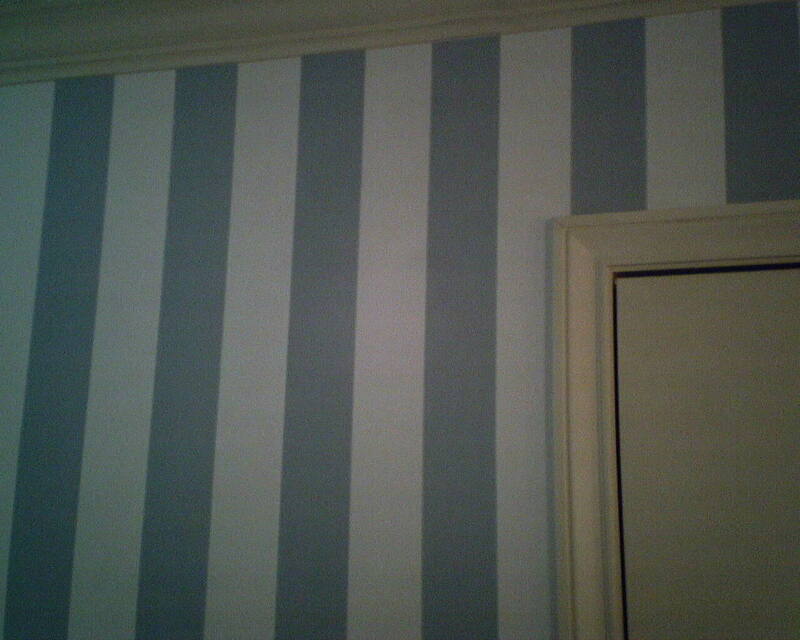 🙂 ) You can align the pattern with one, but not both; I chose to align it with the crown molding at the top of the wall. O.K., that took care of the strip of paper above the window. I still needed to put paper down both sides of the window. 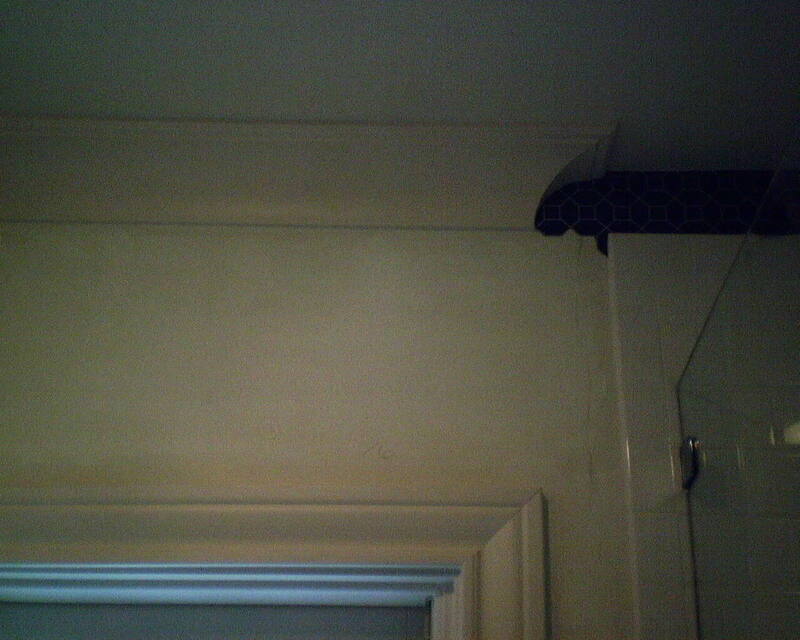 And remember – the window molding was neither parallel with nor perpendicular to the crown molding. 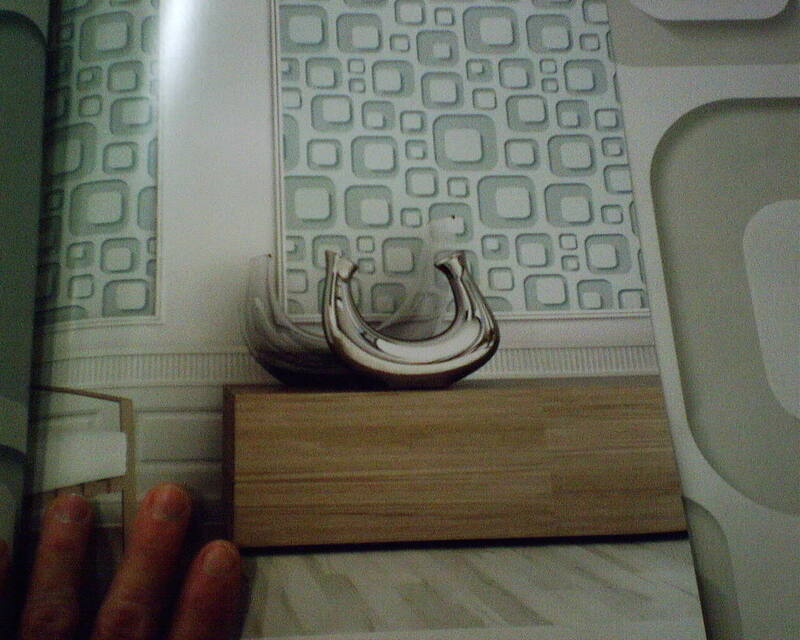 And let’s not forget the shower tile – nothing was aligned with that, either. But those honeycombs had to look like they were parallel with something , or they would look like they had been chopped off irregularly as they made their way down the wall. Underneath the window, I had pretty much the same issues to deal with, but less flexibility in the paper. Still, it worked out wonderfully. The final – and least cooperative – space was the narrow strip between the left side of the window and the cabinet to its left. Again, I pre-trimmed the edge of the paper to align with the design on the paper above the window, and cut along the honeycomb motif to disguise the overlap. It looks perfect, as you can see. However, because this paper along the left side of the window was tweaked, and so was the paper along the right side, as well as the paper under the window, by the time it came to match up all these strips of paper, the pattern design didn’t line up. No biggie. 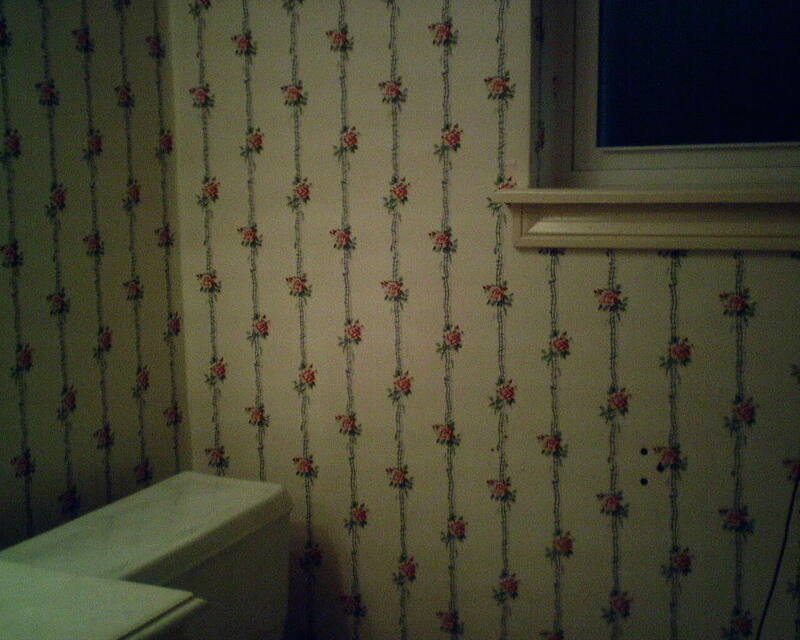 We’re talking a 1 1/2″ wide strip between a raised window molding and a cabinet, and it’s not like anyone is going to be examining the pattern match on the wallpaper in that spot – more likely, she’ll be digging inside that cabinet, completely absorbed in her hunt for a new roll of toilet paper. Still, I couldn’t help myself – I spent a little time creating the illusion of teeny lines and gaps in three strategic places, to disguise the miniscule mismatch, and fool the eye. 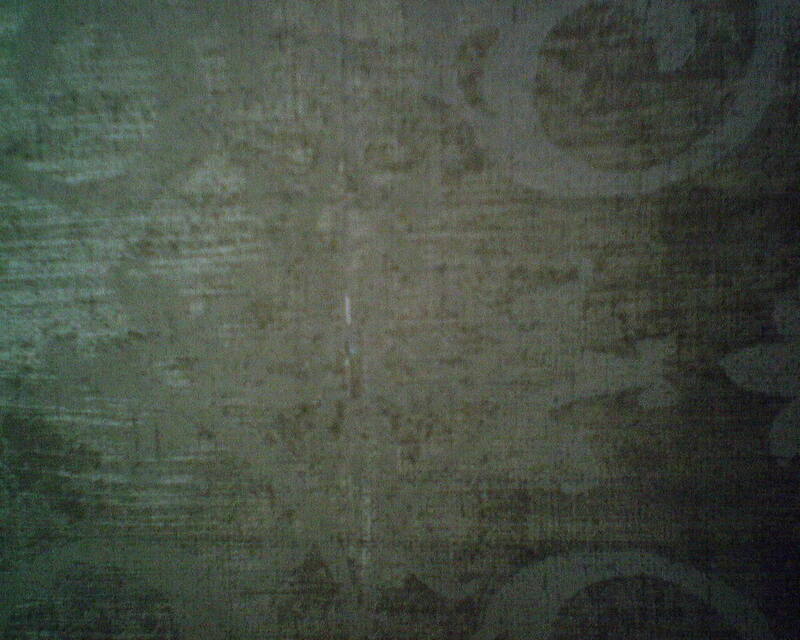 This strip of wallpaper had an abrasion at the edge, leaving some of the white backing exposed. 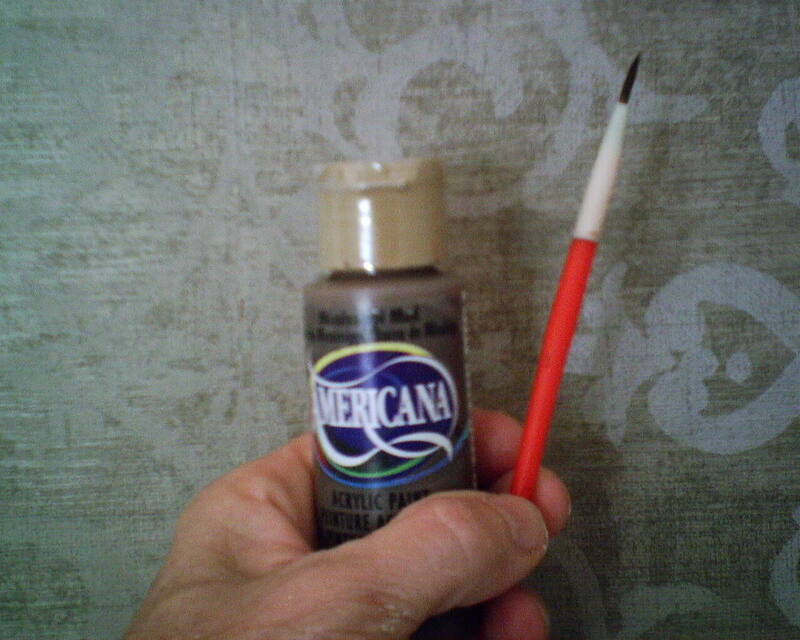 I got out some of my craft paints, a tiny brush, and colored it in. Pictures shot on a rainy day = dark photos. Sorry. But I was tickled to have been able to see this room … You see, I hung this paper last year, in the dining area of a newly-married couple in a home in Oak Forest. When I leave, the walls are beautiful, but the room is not finished, so, when I went back today to hang paper in another room (they’re having their first baby, and I got to paper the nursery! 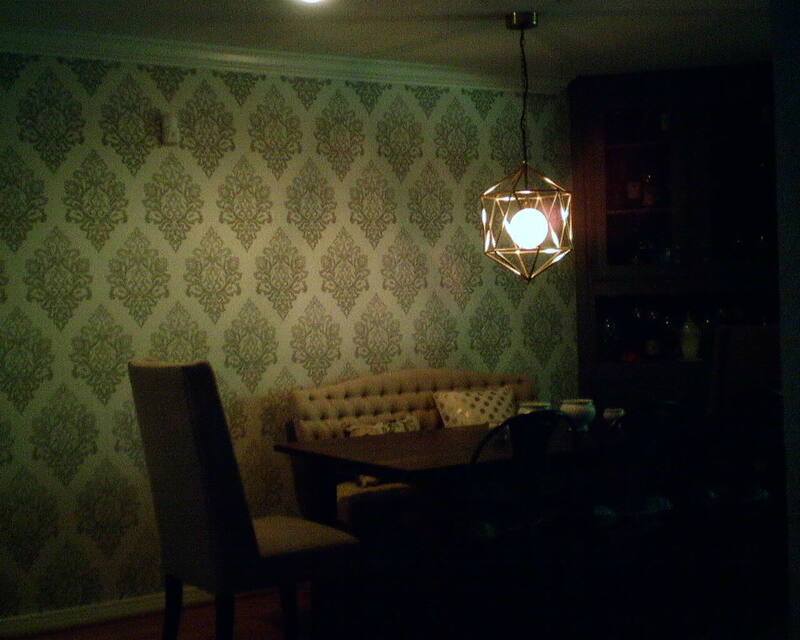 ), I got a look at how the dining room turned out. The photo does not do it justice. This gal has a wonderful knack for design, and she has a bit of sass and glamor, too. There is a little sparkle in the wallpaper, and some sparkle in her throw pillows and on a few other accents around the room. I love the way she uses the bright turquoise vases to toss in a little unexpected accent color. 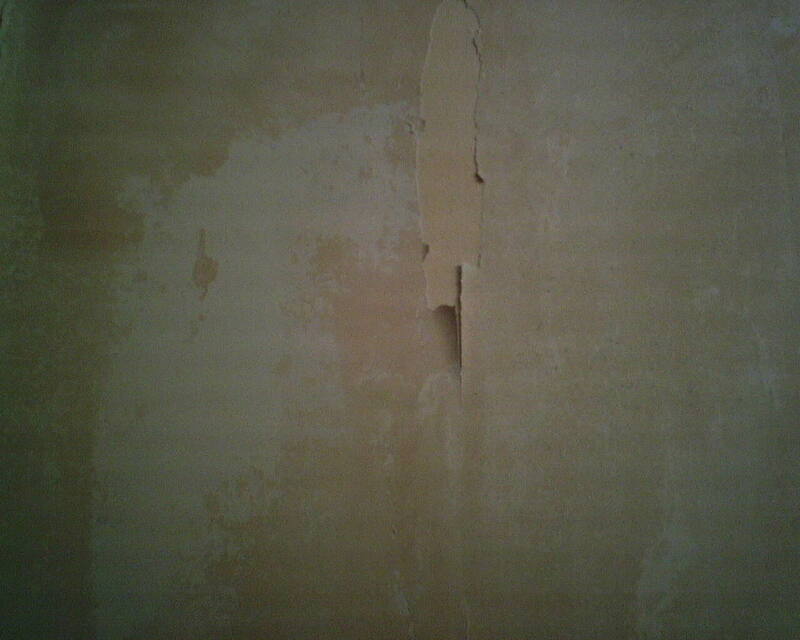 Uncovered a bit of a problem while stripping off old wallpaper today. The original paperhanger smoothed the walls by troweling on joint compound over the lightly-textured, flat-painted walls. 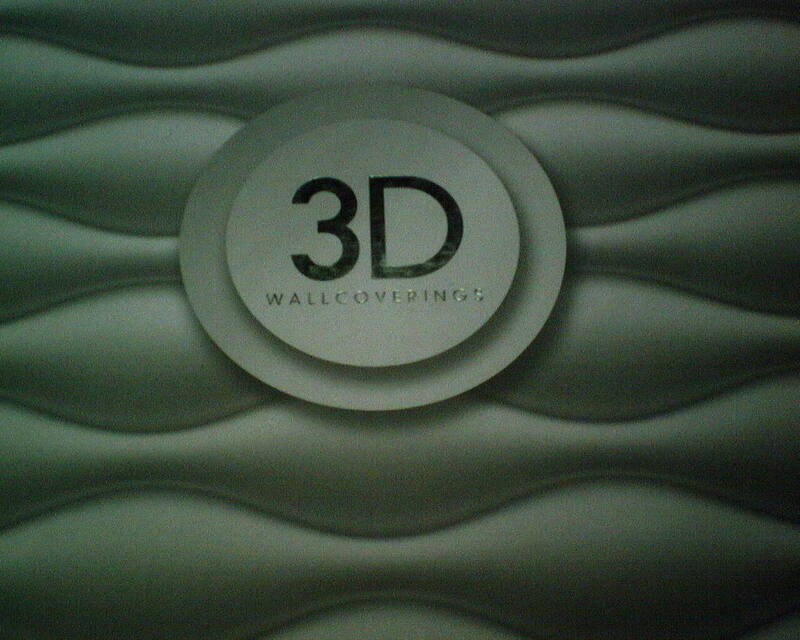 This is all fine – just the way I smooth textured walls, too. However, he failed to prime or seal the joint compound. 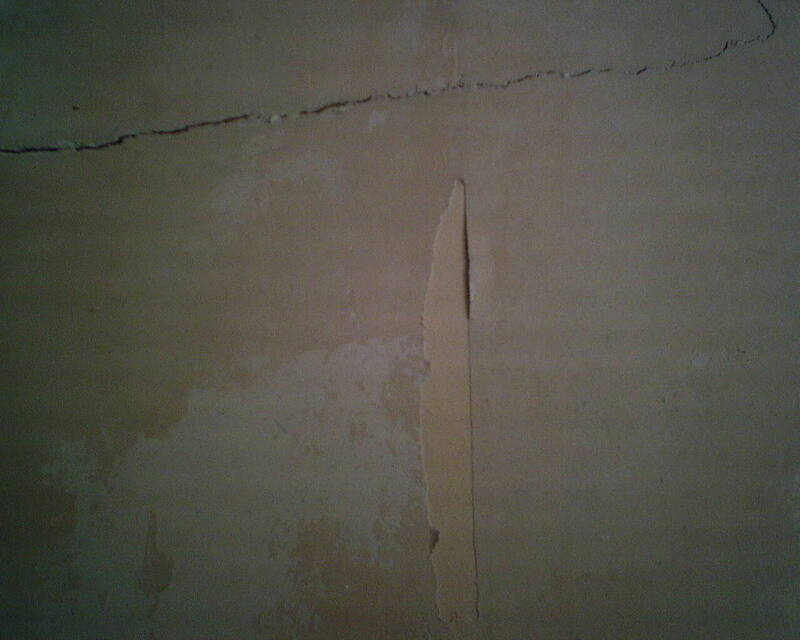 This means that when I wet the walls with water to soften the paste and remove the old wallpaper, the joint compound also got wet and softened. In places where the seams of the wallpaper put tension (we call it torque) on the seams, the joint compound pulled away from the wall. 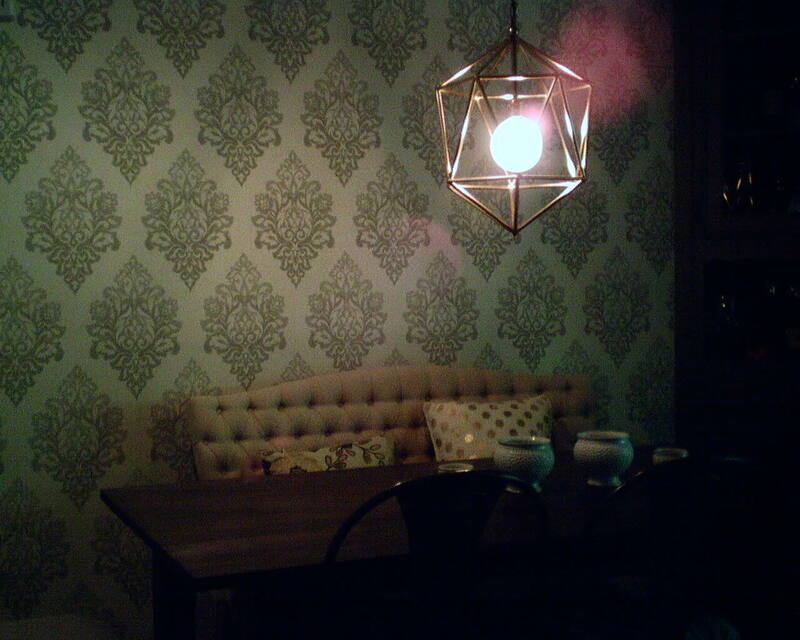 In the first photo, I have stripped off the top, colored layer of wallpaper. 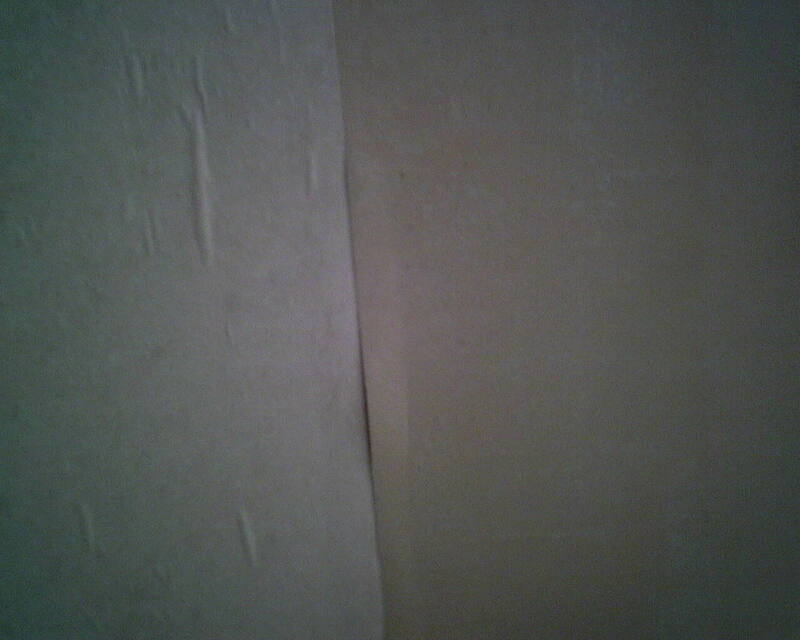 On the left you see the white substrate, which has been soaked with water, and will soon be removed. On the right, the white substrate has already been removed, and what you see is the tan color of his clay-based paste, on top of the joint compound. The lose area in the center of the photo is where the joint compound has pulled away from the wall. 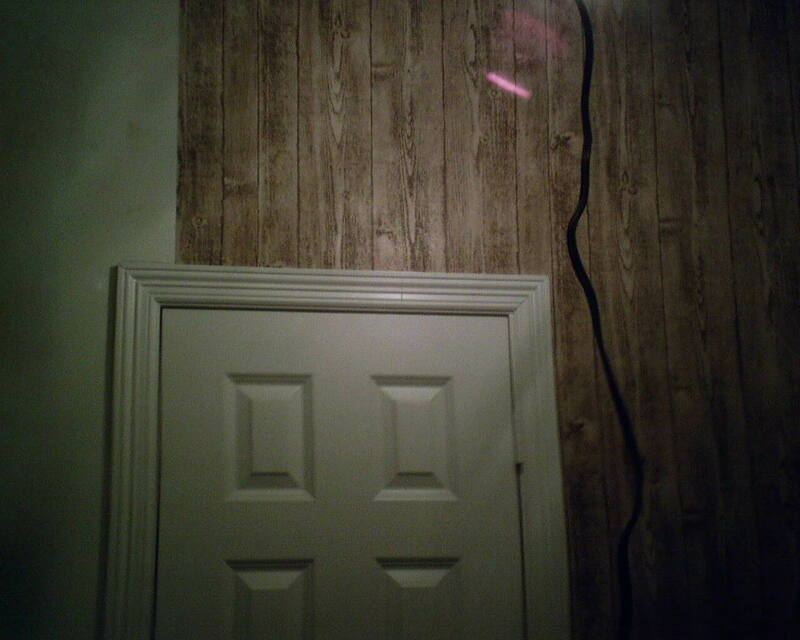 The next photos show the wall with all wallpaper removed, and the area where the joint compound has left a void. 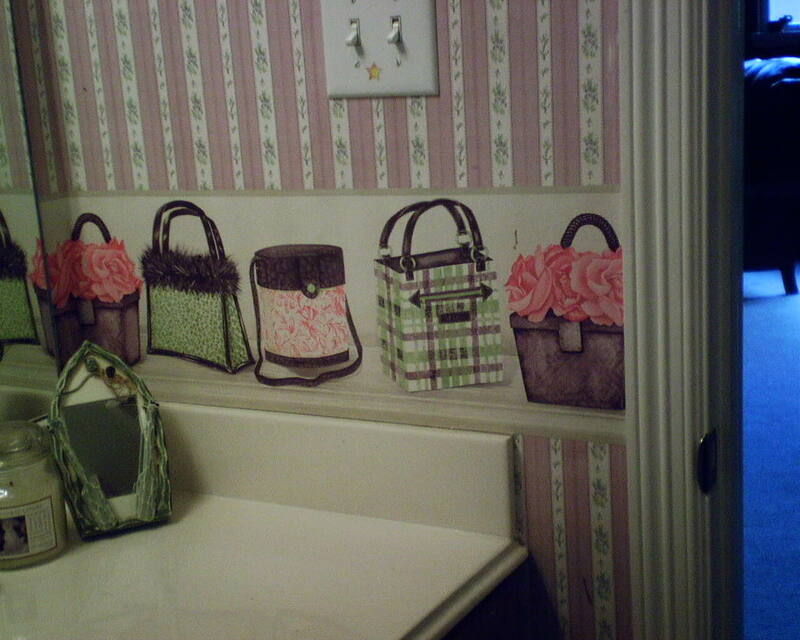 It’s about 3/32″ of an inch deep, and would definitely look horrible under the new wallpaper. 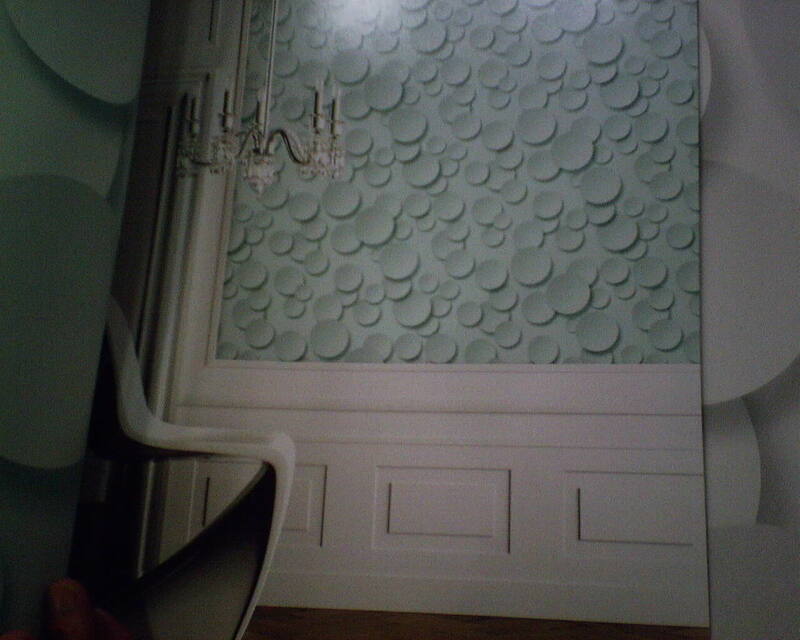 Furthermore, you have to worry about the surface continuing to loosen, possibly marring the new wallpaper job. My solution was to let everything get good and dry. Then I scraped away any loose material (like you see in the last two photos). I then sealed the walls with Gardz, a product that is designed to soak into the wall. It also somewhat binds things together, so hopefully it will hold the joint compound together, and also hold it tight to the painted wall beneath it. Then I took fresh joint compound (it’s something like plaster), and troweled it over the uneven areas. Once it dries overnight, I will sand the areas smooth, wipe off any dust with a damp sponge, and recoat with Gardz. 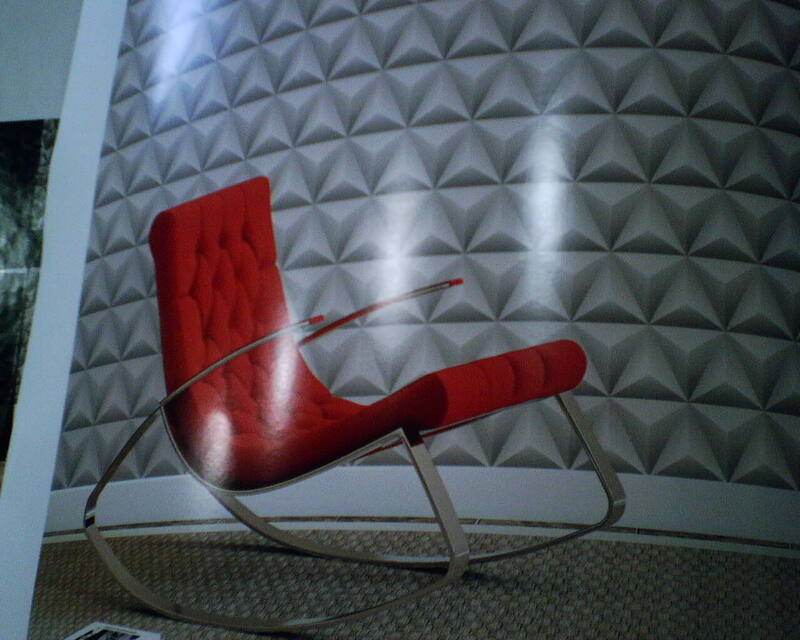 That should yield a good, stable surface for the new wallpaper. 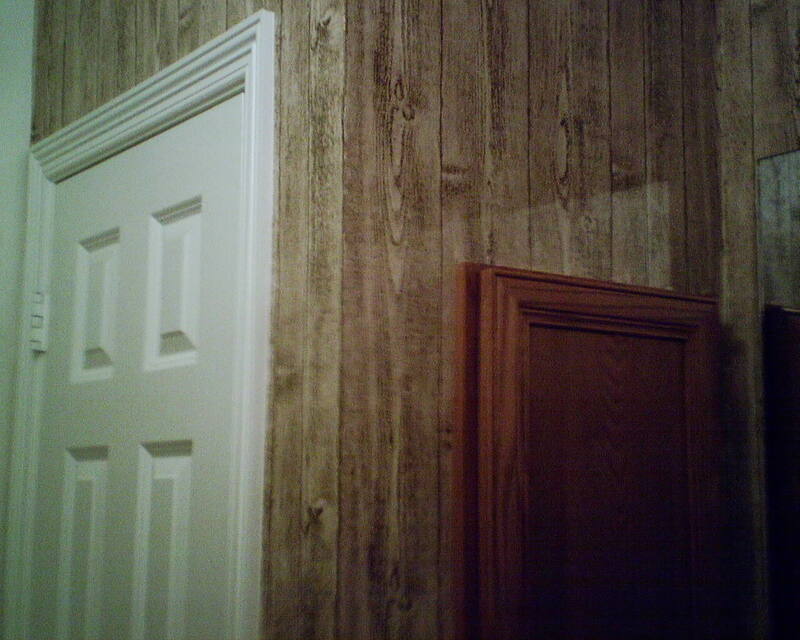 I love the first photo, because it shows the “before” (left of the door) and the “after” right of the door. 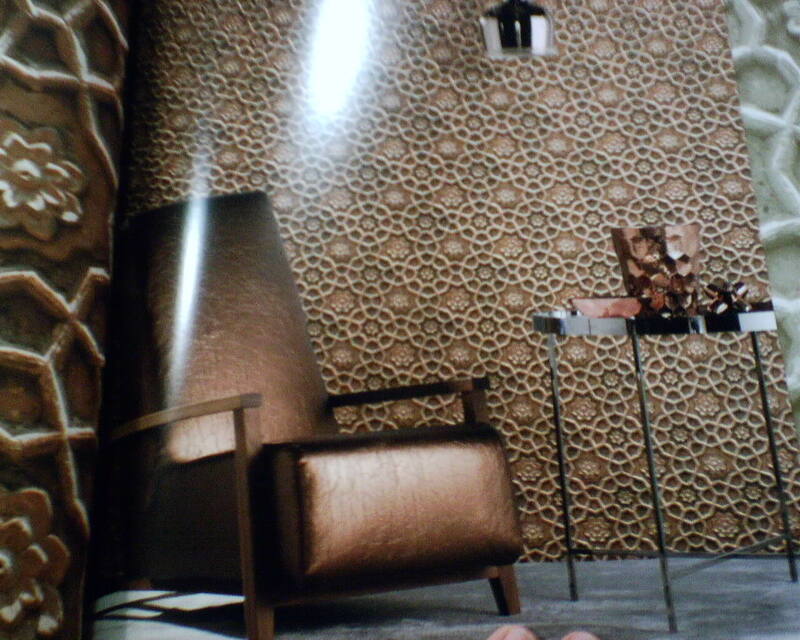 You can really see how the wallpaper pattern transforms the room. 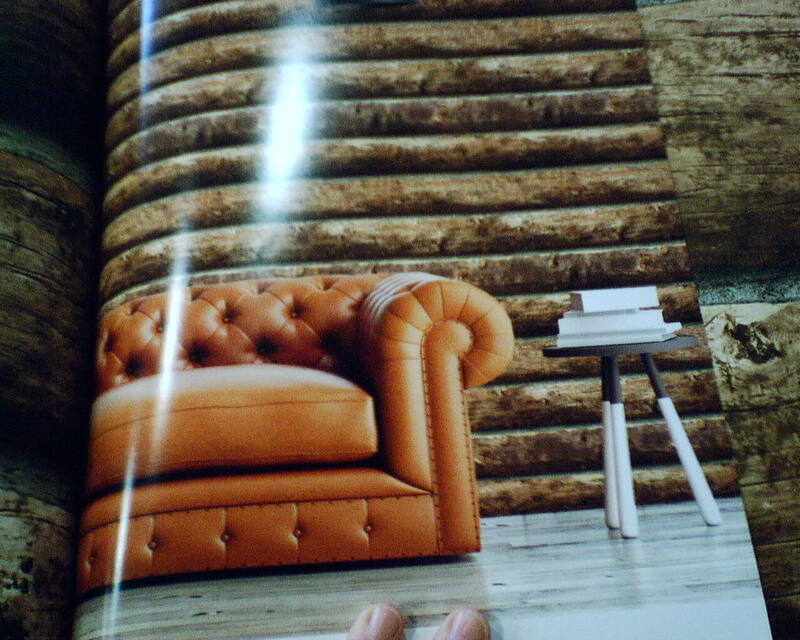 In the second photo, the paper is turning a corner. The close-up shows how realistic the design is. Even the color is spot-on. I have seen similar patterns that had too much pigment in one area, for instance, so, from a distance, your eye was caught by globs of color. This one has a much more uniform, realistic appearance. 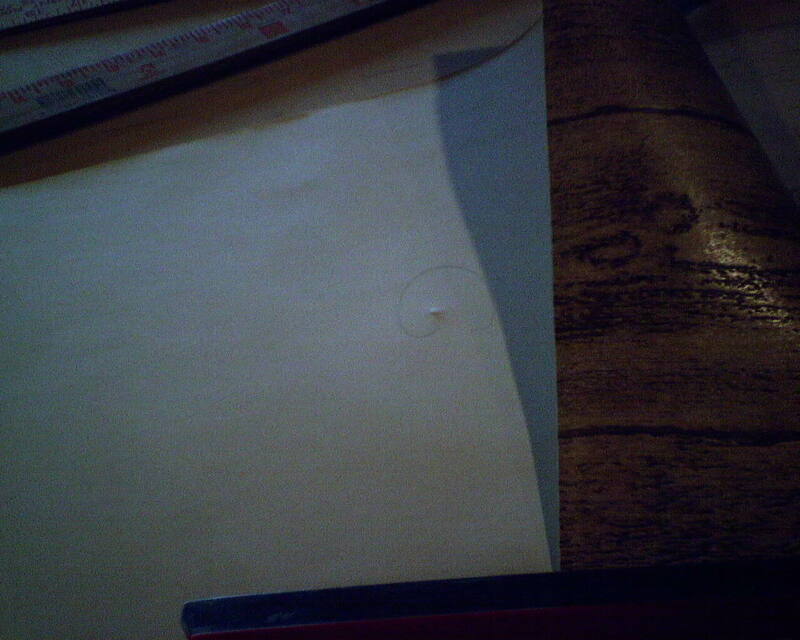 I did have issues with squashed edges for the first 4′ or so of each bolt, and the last bolt had these mysterious indentations poked into the paper. Another reminder of why to always purchase a little more than you think you need. 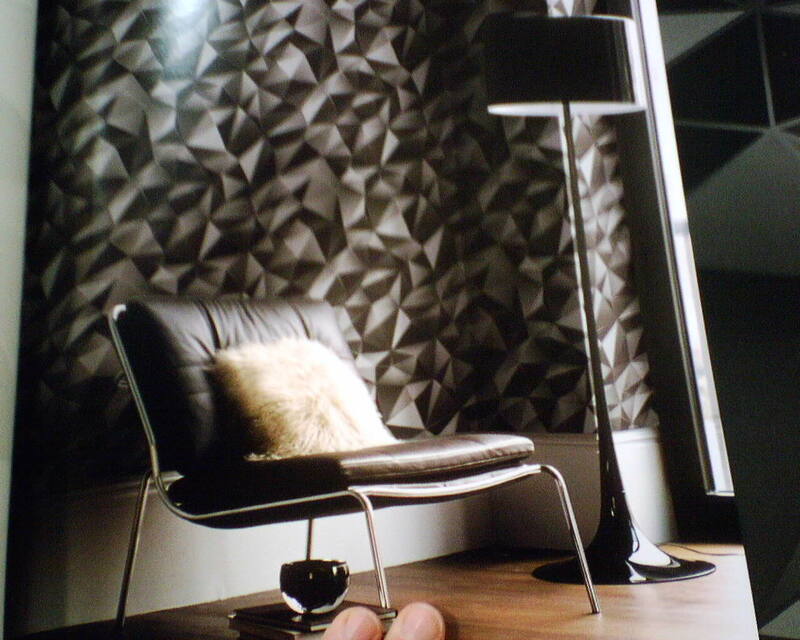 This wallpaper is by Beacon House, and was an expended vinyl product, which means it is thick and spongy and has a textured surface. 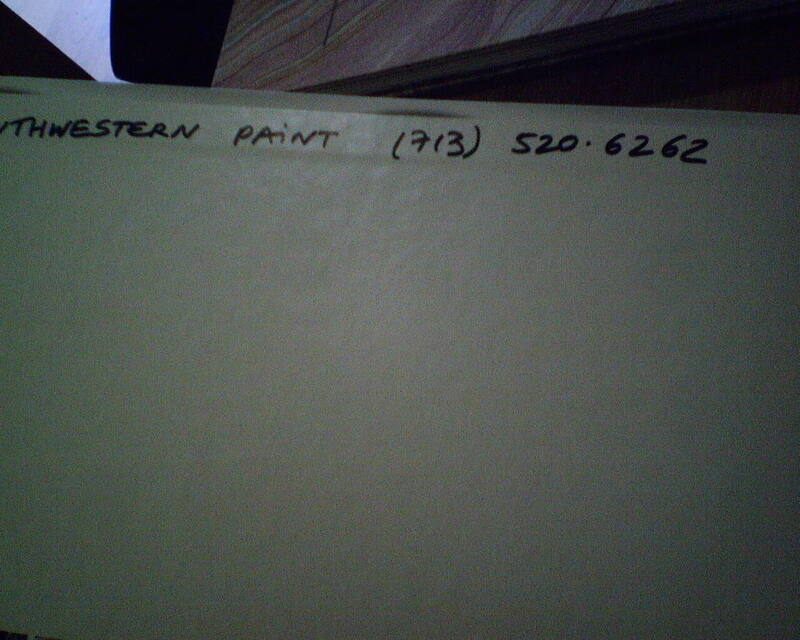 It was bought at a discounted price from Dorota Hartwig at Southwestern Paint on Bissonnet near Kirby. (713) 520-6262 or dorotasouthwestern@hotmail.com. Discuss your project and make an appointment before heading over to see her. CUTE Paper – But It’s a Goner! 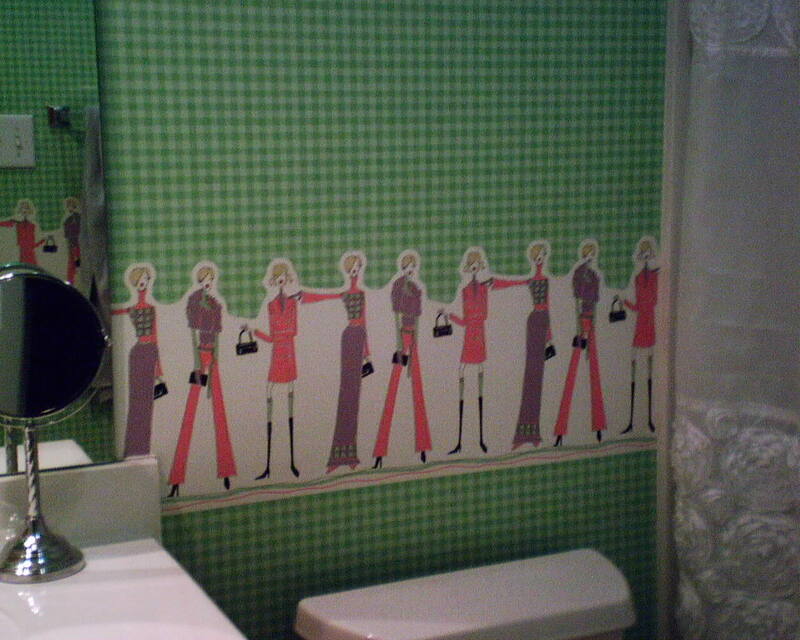 The girls who use these two bathrooms are getting older, and need a more sophisticated look. 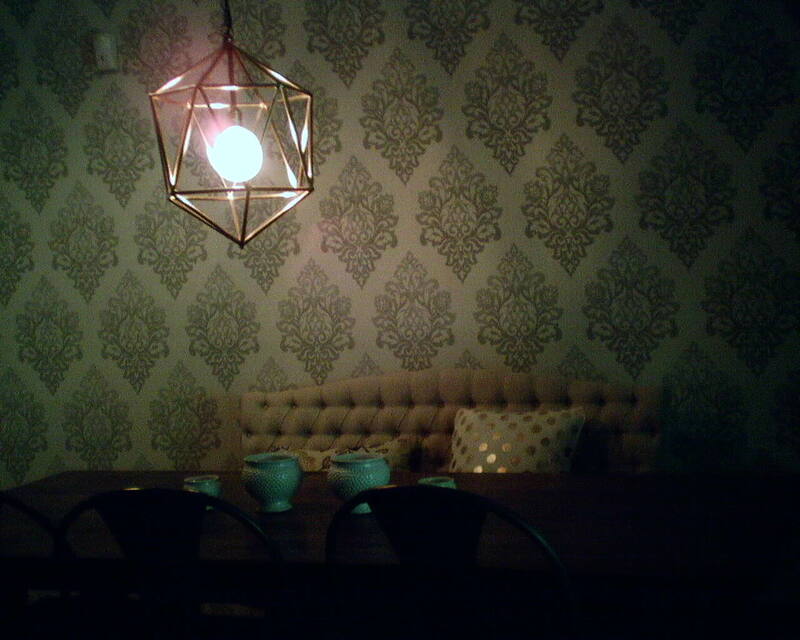 But the rooms are so darned cute, it hurt to strip the paper off! 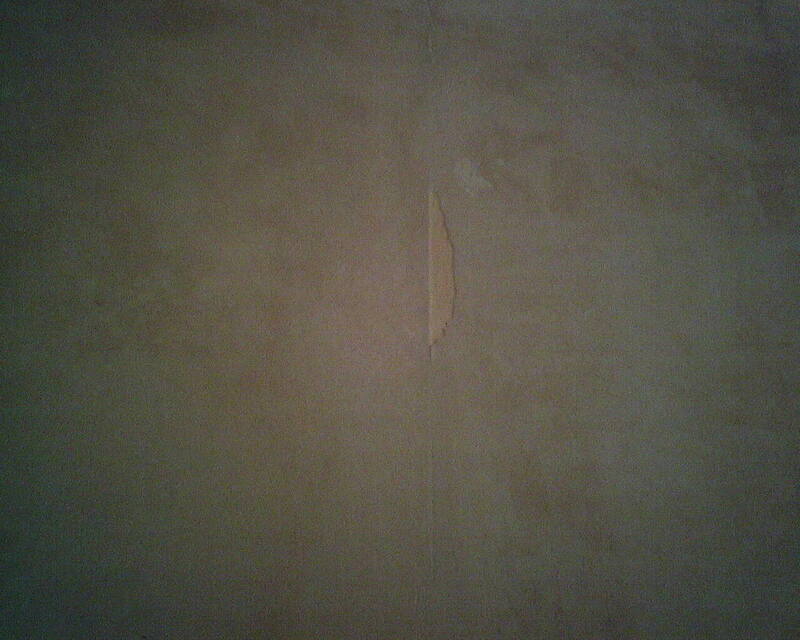 What also hurt is that the previous installer did not prime the walls, but hung the wallpaper directly on the raw Sheetrock. 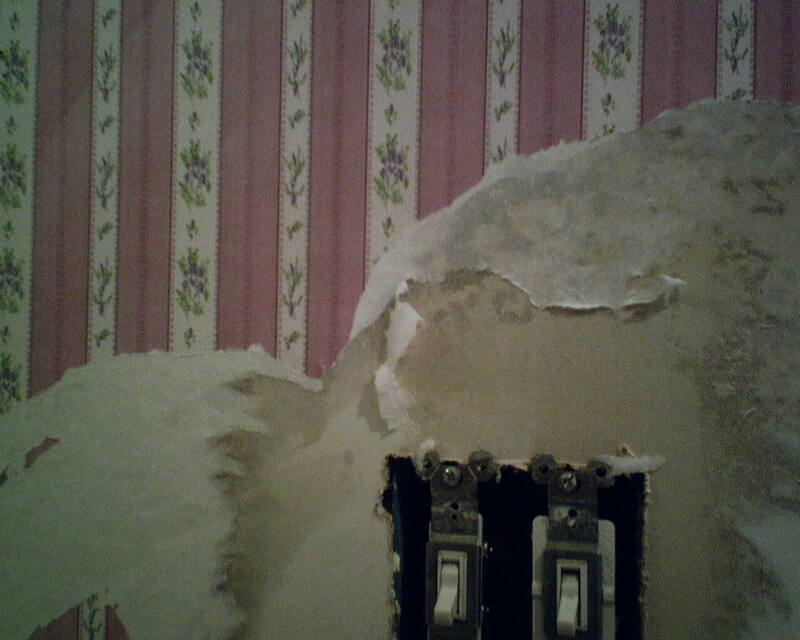 That made it a lot harder to get the wallpaper off, plus increased the possibility of tearing the Sheetrock, which is a big problem. 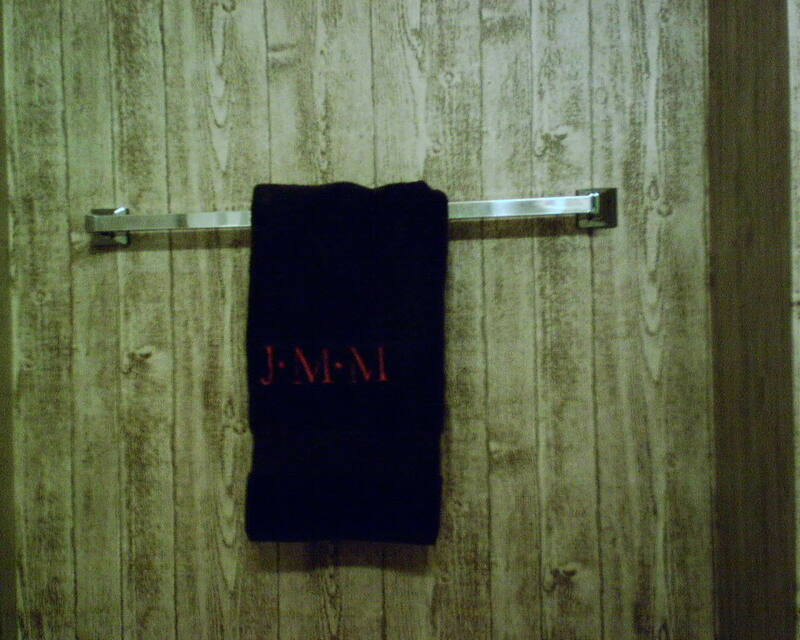 It was even harder to get the wallpaper off the greenboard, which was used around the shower areas. 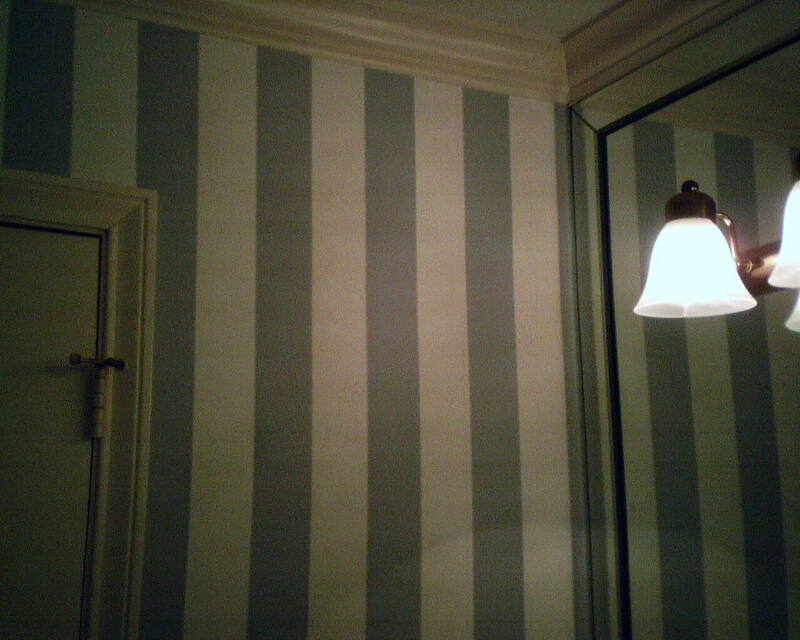 The bottom photo is a good shot of how wallpaper is stripped off the wall. 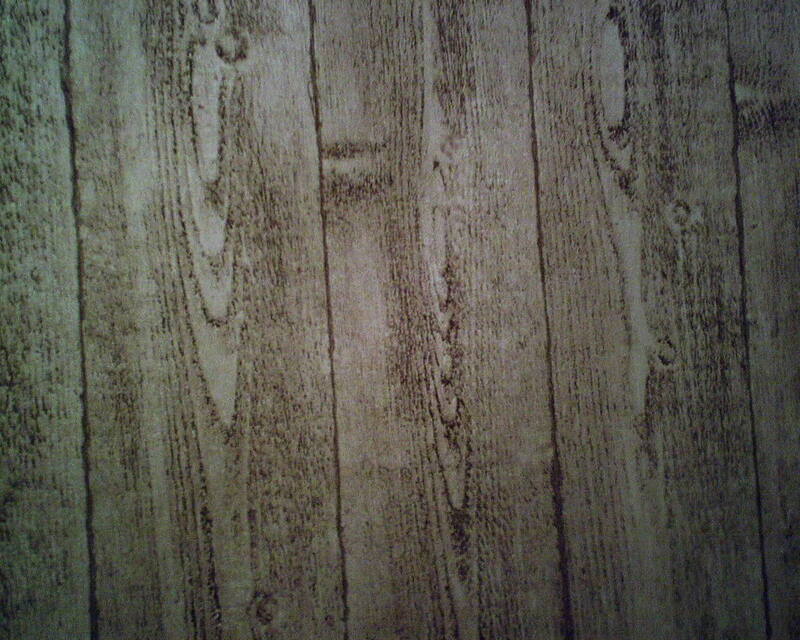 You can see how the top inked layer has been pulled off, leaving the white backing still on the wall. This layer is soaked with warm water and a sponge, and, once the paste has been reactivated and softened, that backing layer can be gently pulled or scraped away from the wall, revealing the Sheetrock underneath. Once I got all the paper off, I washed the walls to remove paste residue, patched little dings in the walls, and then primed with Gardz, which is a good sealer in the event that any paste residue still clung to the walls. You are currently browsing the Wallpaperlady's Blog blog archives for August, 2015.